For decades, scientists have been using two-dimensional cell culture platforms for high-throughput drug screening of anticancer drugs. Growing evidence indicates that the results of anti-cancer drug screening vary with the cell culture microenvironment, and this variation has been proposed as a reason for the high failure rate of clinical trials. Since the culture condition-dependent drug sensitivity of anti-cancer drugs may negatively impact the identification of clinically effective drug candidates, more reliable in vitro cancer platforms are urgently needed. In this review article, we provide an overview of how cell culture conditions can alter drug efficacy and highlight the importance of developing more reliable cancer drug testing platforms for use in the drug discovery process. The environmental factors that can alter drug delivery and efficacy are reviewed. Based on these observations of chemoresistant tumor physiology, we summarize the recent advances in the fabrication of in vitro cancer models and the model-dependent cytotoxicity of anti-cancer drugs, with a particular focus on engineered environmental factors in these platforms. It is believed that more physiologically relevant cancer models can revolutionize the drug discovery process. Since the launch of the “war on cancer” in 1971 in the United States, many cancer biologists and pharmaceutical companies have been striving to conquer cancer. Cancer biologists have identified the molecular mechanisms underlying the characteristic behaviors of cancer cells including the extensive proliferation, degradation of the surrounding extracellular matrix, migration and even vascularization[2, 3]. Based on the identified signaling pathways and biomolecular factors, pharmaceutical companies have developed various anti-cancer drugs termed 'magic bullets,' which can specifically inhibit the actions of their molecular targets. Although a few drugs have demonstrated promising ability, such as those for the treatment of metastatic melanoma[4, 5], many of the drugs do not satisfy the expectations of conquering cancer. As proposed by Hanahan, this low efficacy of targeted cancer chemotherapy is because of the “adaptive and evasive resistance strategies developed by cancers under attack”. One of the important factors is that cancer cells change their responsiveness to drugs by changing their interaction with the surroundings. Earlier studies focused mainly on the cancer cell itself rather than on the interactions between the cancer cells and their surroundings. However, the role of tumor microenvironment (TME) in tumor progression and drug efficacy has recently attracted much attention[6, 7]. TME includes, in addition to the cancer cells, the physical, chemical, and biological components around the cancer cells, such as the extracellular matrix (ECM), interstitial flow, stromal cells, immune cells, vascular networks, and biochemical concentration gradients (Fig. 1A). Recent studies have indicated that the TME can significantly affect cancer progression including malignancy, invasion, and metastasis[8, 9]. Frequently, researchers overlook the environmental factors and utilize traditional two-dimensional culture techniques because of the ease of handling and the possibility of a large number of parallel analyses[10-12]. However, the results of efficacy and toxicity assays using traditional cell culture models (e.g., monolayer cell culture) exhibit significant differences from those of animal studies and human trials. This is one of the reasons for the failure of many drug candidates in clinical trials[13, 14] and is partly due to the limited utility of 2D culture models for drug screening because of the absence of the complex microenvironment of native tumors. Two-dimensional culture methods are not able to replicate the cell-cell and cell-extracellular environment interactions, which are important factors in vivo (Fig. 1B). These interactions are responsible for cell differentiation, proliferation, vitality, expression of genes and proteins, drug metabolism, and other cellular functions[16-18]. In addition, the modes of cell division and adhesion are restricted under 2D conditions. These features affect the organization of the intracellular structures and cell signaling[19, 20]. Finally, unlike natural in vivo tumors, 2D cultured cells in a monolayer have unlimited access to oxygen, nutrients, and signaling molecules from the culture medium. These environmental factors are significantly different in 2D cultures compared to those in the in vivo tumors and can skew the experimental results. Clinically efficacious drug candidates might be eliminated during early screening, and compounds with lower or no clinical efficacy might progress into clinical trials, resulting in increased developmental cost and time. It is therefore necessary to develop physiologically relevant in vitro cancer models to better predict the efficacy and toxicity of anti-cancer drugs[22-24]. Several techniques have been developed to overcome the limitations of traditional 2D cell culture models and allow the experimental models to mimic the in vivo microenvironment more closely. These techniques replicates the physiological features of the TME such as cell-cell interactions, fluidic shear stress, and cell-ECM interactions. This review discusses how the efficacy or the toxicity of anti-cancer drug candidates can be changed by altering the cell culture conditions. For this purpose, we first discuss the physiological characteristics of the TME with a particular focus on the interaction between the TME components and cancer cells. 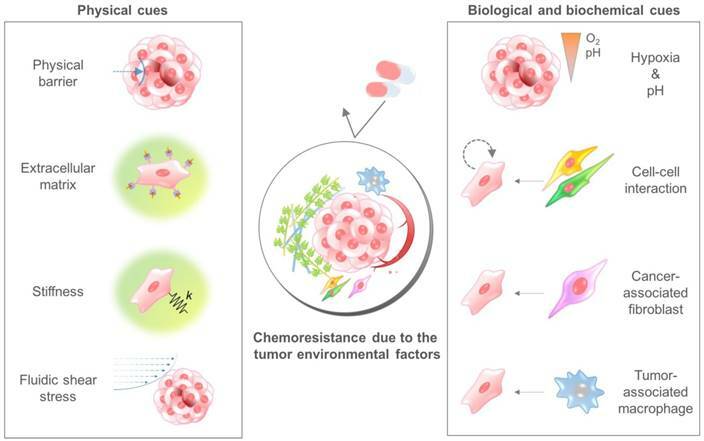 The review will then describe the efforts for the development of biomimetic cell culture platforms, which can replicate the features of tumor physiology. Finally, this review will discuss the difference in the efficacy of anti-cancer drug candidates depending on the in vitro models used, which underscore the importance of reliable drug screening platforms. The differences between the native tumor microenvironment (TME) and the conventional in vitro cancer models in terms of the recapitulation of physiological factors. (A) The physiological conditions within the native TME. (B) The features of the conventional 2D or plastic dish-based cancer models. Because the conventional cancer models do not reflect the important environmental cues observed in the TME, the behaviors and responses of cancer cells in vivo cannot be fully recapitulated in the experimental conditions. In particular, tests of the efficacy or cytotoxicity of anticancer drugs frequently show misleading drug screening results, increasing the time and cost of drug discovery. The TME comprises multiple cellular and noncellular components organized in a three-dimensional form[25, 26]. The representative TME factors that can affect the chemosensitivity of cancer cells are summarized in Table 1. Various TME factors are classified into two categories, physical and biological/biochemical cues, and their roles in drug delivery and efficacy are summarized in the next sections (Fig. 2). The physical components of the TME can affect the sensitivity of tumor cells to drugs. Physical cues that can affect drug delivery and efficacy include high cell density, fluid pressure, the extracellular matrix, and stiffness. Drugs are generally delivered to the tumor mass through interstitial spaces via diffusion and pressure-driven circulation. During the delivery process, drugs encounter physical and biochemical barriers. Sutherland et al. demonstrated that the efficacy of anti-cancer drugs was reduced when the cells were cultured in 3D spheroids rather than in 2D monolayer cultures due to the limited transport of drugs through the densely packed cells. Therefore, a majority of the anticancer drugs exhibit limited penetration into solid tumors and reduced toxicity[28-32]. For example, the organization of the surrounding ECM increases the interstitial fluid pressure because the expansion of the tumor mass strongly affects the efficiency of drug delivery. The rapid growth of the tumor mass induces outward fluid flux from the tumor mass to the surroundings and hinders drug delivery towards the neoplasms. The tumor microenvironmental factors that cause chemoresistance of cancer cells. Physical cues include the physical barrier, binding to the extracellular matrix component, stiffness-induced mechanotransduction, and fluidic shear stress. Biological and biochemical cues include hypoxia, low pH, cell-cell interaction, cancer-associated fibroblasts, and tumor-associated macrophages. Because each cue induces the chemoresistance of cancer cells through different mechanisms, a combinatorial consideration of those factors using innovative in vitro cancer models is required to identify the exact efficacy of anticancer drugs. Chemoresistance mediated by receptor-ligand interaction of the cancer cell with the surroundings is termed cell adhesion-mediated drug resistance (CAM-DR). Cancer cells can interact with stromal cells in their proximity or with the extracellular matrix to which they adhere, such as collagen, laminin, and fibronectin. When a cancer cell (either hematopoietic or epithelial) comes into intimate contact with the stromal cells or ECM components via integrins, adhesion induces not only the quiescent state but also the production of pro- and anti-apoptotic molecules[37, 38]. Therefore, cancer cells can acquire chemoresistance via their interaction with stromal cells or with the ECM. For example, the acute myelogenous leukemia (AML) cell lines, when cultured on fibronectin-coated substrates, exhibit increased chemoresistance to treatment with daunorubicin (DNR) and arabinoside (AraC); integrin α4β1 is important for this chemoresistance. It has also been shown that integrin α4β1-mediated chemoresistance is closely related to patient outcome, showing a higher relapse rate and a decreased survival rate in the case of patients expressing high levels of integrin α4β1. Since the mechanism underlying cell-cell and cell-ECM interaction-mediated chemoresistance is not associated with transcriptional regulation[37, 41, 42], drug sensitivity can be restored when the microenvironmental factors are removed. The composition of the ECM can also significantly affect chemoresistance. Previous studies on native tumor microenvironments have indicated that type I collagen, a major component of the tumor stroma, can promote the invasive progression of cancer. Furthermore, the correlation between the chemoresistance and the abundance of the tumor stroma of pancreatic cancer has also been considered a therapeutic target to overcome the limitations of conventional chemotherapy[45, 46]. In this context, Cramer et al. demonstrated that the ECM-component-mediated epithelial-to-mesenchymal transition is an important factor in chemoresistance. In this study, the tumor spheroids were embedded in type I collagen-rich or laminin-rich bulk ECM matrix, and the behaviors of the cancer cells were monitored. Interestingly, the cancer cells embedded in a spheroid form within the type I collagen matrix showed significant invasion into the surrounding matrix, similar to individual cells showing epithelial-to-mesenchymal transition, whereas the spheroids embedded in a laminin-rich matrix showed no such dissemination. In addition, upon oxaliplatin chemotherapy, the invading populations of cancer cells (observed only in the collagen I matrix) showed significant chemoresistance, while the tumor spheroids in both matrices were reduced in size, demonstrating tumor spheroid-specific chemosensitivity. The effect of matrix stiffness on the malignancy of cancer cells can be evaluated by using stiffness-tunable hydrogels[48, 49]. Previous studies have indicated that the stroma around the native tumor becomes highly fibrotic and stiffen, especially for pancreatic ductal adenocarcinoma[50, 51], and the altered ECM mechanics is related to the malignancy of tumor. Furthermore, matrix stiffness has been also known to induce chemoresistance to paclitaxel in hepatocellular carcinoma . Rice et al. investigated the effect of matrix stiffness on the chemoresistance with a particular focus on the matrix stiffness-induced epithelial-mesenchymal transition (EMT) and the subsequent acquisition of chemoresistance [53, 54]. The 3D environment in which cancer cells are surrounded by the ECM has different drug delivery conditions compared to the widely used 2D plastic dish. In the case of the 2D plastic dish, drugs, oxygen, and nutrients can access the cells unlimitedly; therefore, the diffusion-limited or perfusion-controlled delivery mechanism observed in vivo cannot be recapitulated. According to a previous study, the cytotoxic effect of the anti-cancer drug paclitaxel was lower in cells grown in the 3D hydrogel environment (40-60% survival rate) compared to that in cells grown in the 2D plastic dish (20% survival rate) due to the limited access of drugs to the cancer cells in the former. The uncontrolled growth of cancer cells generates densely packed cell spheroids. In this explosive growth stage, the high rate of metabolism of cancer cells and the limited availability of oxygen results in a concentration gradient of oxygen along the depth of the tumor mass[56, 57]. The presence of hypoxia in tumors has been reported to increase the expression of the genes encoding P-glycoprotein and dihydrofolate reductase, which induce resistance to substrates of P-glycoprotein and folate antagonists, respectively[58-60]. Furthermore, increased expression of hypoxia-inducible factor 1 (HIF-1) stimulates cancer cells and promotes drug efflux out of the cancer cells by the overexpression of P-glycoprotein and the multidrug resistance (MDR1) gene[61, 62]. 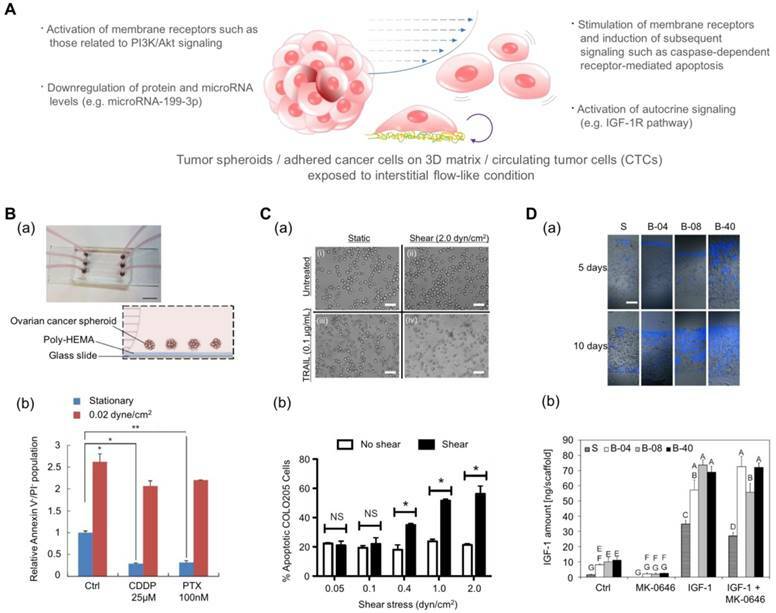 The increased encoding of HIF-1 in cancer cells is also known to enhance the anti-apoptotic signals of cancer cells, and thus the survival rate of cancer cells increases upon exposure to chemotherapeutic agents. For example, a hypoxic condition promotes the production of growth factors such as platelet-derived growth factor B (PDGF-B), transforming growth factor β (TGF-β), and epidermal growth factor (EGF) and increases the survival rate of cancer cells[63, 64]. The quiescence of cancer cells due to the low level of oxygen tension can limit the cytotoxic effect of the drugs targeting rapidly proliferating cancer cells. Such an effect is especially important in the submarginal layer of the tumor volume in which the cancer cells neither proliferate nor die, showing a quiescent metabolic state unless another stimulation is applied. Many anti-cancer drugs are designed to generate free radicals, which are harmful to DNA in the presence of oxygen. The free radicals accept electrons from biologic sources and then transfer the electrons to oxygen. However, in a hypoxic environment such as the deeper regions of the tumor mass, the cytotoxicity of anti-cancer drugs whose activity is mediated by free radicals is inevitably weakened. In addition to the limited availability of oxygen, the hypoxic regions of tumors are also likely to have limited access to nutrients such as glucose and essential amino acids. For this reason, tumor cells in the inner regions of the tumor mass use glycolysis to generate energy for survival and proliferation, leading to the production of CO2 and carbonic acid. The accumulation of these acidic products of metabolism results in low interstitial pH, which is one of the characteristics of solid tumors[69, 70]. The pH in the TME influences the efficacy of anti-cancer drugs. Drug molecules diffuse passively into the cell in an uncharged form. In the acidic extracellular pH, weakly basic drugs such as doxorubicin, mitoxantrone, vincristine, and vinblastine, are prone to protonation. Since the cell membrane is negatively charged, positively charged drugs suffer from lower cellular uptake than those in the neutral state of charge, which is known as 'ion trapping' [69, 71, 72]. As well as the inefficient drug delivery into the cancer cells, low pH promotes P-glycoprotein-mediated drugs efflux and reduce the intracellular drug concentration. In addition, the chronic exposure to acidic pH increases the level of intracellular proteins such as heat shock protein HSP27, causing chemoresistance to chemotherapeutics. Intercellular interactions can also enhance the chemoresistance of the cells. According to earlier studies, the stromal cells near the cancer cells play supportive roles in the survival of cancer cells and the acquisition of chemoresistance via several mechanisms. For example, the stromal cells can enhance the chemoresistance via direct cell-cell interactions such as crosstalk or oncologic trogocytosis, and the autocrine- and paracrine-mediated activation of anti-apoptosis signaling increases chemoresistance. The stromal cells near the cancer cells or surrounding ECM can activate anti-apoptotic signaling via the binding of integrin receptors of cancer cells and the corresponding ligands provided by the stromal cells or the ECM components[40, 77]. The coculture of cancer cells with stromal cells also induces cytokine-mediated chemoresistance. For example, cancer cells acquired chemoresistance when cocultured with cancer-associated fibroblasts (CAFs) via CAF-secreted chemokines such as interleukin-6 (IL-6), interleukin-11 (IL-11), interleukin-17 (IL-17), chemokine C-C motif ligand-1 (CCL1), and stromal cell-derived factor 1 (SDF-1)[79-83]. Recent studies have also proposed that effector T-cells can abrogate such CAF-induced chemoresistance by modulating the metabolism of CAFs. Exosomes secreted by cancer cells or nearby CAF have also been known to mediate cancer resistance. Among the components loaded in the exosomes, the encapsulated miRNAs (e.g., miR-155, miR-100, miR-222, miR-30a, and miR-146a), which are produced by chemotherapy-treated cancer cells and CAFs, play significant roles in the acquisition of chemoresistance[85-87]. For instance, the miR-155 transferred between gemcitabine-treated pancreatic cancer cells promotes chemoresistance by the detoxification of reactive oxygen species and miR-155-mediated suppression of the gemcitabine-metabolizing enzyme. Tumor-associated macrophages (TAMs) are observed in tumor tissues with high density, but their clinical implications are different depending on the organs: TAMs in colorectal cancer show an anti-tumor (M1) phenotype while most of the TAMs in other organs display pro-tumor and immunosuppressive properties (M2)[89-91]. Importantly, in TAMs with pro-tumor properties, numerous TAM-secreted cytokines including IL-6, signal transducer and activator of transcription 3 (STAT3), and cathepsin B and S have been known to induce the chemoresistance of tumors by activating the anti-apoptotic programs of tumor cells[92-95]. Recent studies have indicated that the polarization of macrophages is a crucial determinant of the drug response, especially through the activation of the cytotoxic response of T cells. For instance, docetaxel, partly induces antitumor activity by depleting immunosuppressive TAMs and by activating anti-tumoral monocytes. These results indicate that the reprogramming of the polarization states of TAMs might be an efficient way to resolve the chemoresistance of cancer. As discussed above, the physical and biological/biochemical cues in the TME weaken the cytotoxic effects of anti-cancer drugs. Therefore, it is obvious that the traditional monolayer cell culture model does not represent the complex microenvironment of the tumor. The following section discusses how the engineered cell culture models, with their ability to reproduce the surrounding environment including the physical, biological/biochemical cues, can address these issues[98-103]. In this section, recent approaches that mimic the TME using the engineered platforms are overviewed. The following examples controlled various factors of the TME such as aggregation of cancer cells, cell-cell interaction via direct contact or cytokine-mediated crosstalk, fluidic shear stress, and structure and composition of biomaterials. These platforms successfully mimicked the TME factors in the engineered cancer models, and demonstrated more in vivo-like cancer cell growth, cytokine release, cell-cell interaction and drug delivery. Cancer cells usually showed chemoresistance against the anticancer drugs in the TME-mimetic cancer platforms, suggesting the importance of physiologically relevant cancer models in the testing of the anticancer drug efficacy. In the following sections, the examples of the engineered cancer models will be reviewed. Tumor spheroids have been one of the widely used 3D models for cancer study. Tumor spheroids can recapitulate the dense 3D structures of native tumors in terms of their shape and the characteristics of tumors such as hypoxia, limited molecular transport, and metabolic changes. From an engineering point of view, 3D tumor spheroids can be fabricated by facilitating cell-cell interactions via physical confinement. In this process, the cell-substrate interaction must be minimized with adequate surface coating or modification. Otherwise, the cells adhere to the substrate rather than form cell aggregates. Various methods have been developed to generate tumor cell spheroids. The hanging drop method is a commonly used technique for generating cell aggregates. A small aliquot (normally 10 to 30 μL) of the cell suspension is placed onto the lid of the culture plate, and the lid is subsequently inverted. The drop of cell suspension remains adhered to the lid, and thus the cell suspension makes a hanging drop. Cells accumulate at the bottom of the drop (liquid-air interface) and assemble into a 3D spheroid form. However, the culture media cannot be exchanged in this method, and thus it is not suitable for long-term culture. The microwell technique was developed to address this shortcoming. Using low surface energy materials such as elastomer or coating the wells with cell-repellent materials such as poly (2-hydroxyethyl methacrylate) (pHEMA), the spontaneous formation of cell spheroids at the bottom of the microwell can be facilitated because the cell-cell interaction is stronger than the cell-substrate interaction[107, 108]. In contrast to the hanging drop method, this microwell system enables the changing of the media during incubation. For cell-cell communication, interspheroid interaction is available via paracrine signaling through the media. A rotating wall vessel can be used to induce polarity or to apply fluidic shear stress to the cell spheroid[110-112]. According to previous studies, 3D tumor spheroid models showed higher resistance to drug candidates than 2D models. There are several straightforward explanations for the differential drug resistance observed between 2D and 3D cultures (Fig. 3A). First, the penetration of drugs into the 3D spheroid is difficult compared to that into cell monolayers due to the physical barrier of outer cell layers[113-115]. Most of the cytotoxic effects of the drugs can be observed in the outer layers of the cells in the spheroids. Second, drug sensitivity changes in response to acidity. Earlier studies have suggested that weakly acidic drugs might have the advantage of enhanced permeability because of the slightly acidic extracellular pH[117-119]. Third, the quiescent zone in the tumor spheroid can alter the cytotoxic effect of drugs. Some anti-cancer drugs act by inducing DNA damage during cellular proliferation, ultimately leading to apoptosis. Therefore, these drugs are effective in rapidly proliferating cancer cells and are termed antimitotic chemotherapeutic agents. However, due to the nonproliferating nature of cells in the quiescent zone, which is located between the core and outer layer, cells in the dormant stage remain protected. For this reason, tumor spheroids may shrink but are not completely killed. Therefore, the tumor can resume proliferation once the cells in the outer layer are dead[114, 120]. Fourth, the low oxygen level in the inner zone of the tumor mass induces the expression of HIF-1 in the cancer cells. The increased level of HIF-1 has been known to be associated with chemoresistance in various cancer cells[122, 123]. 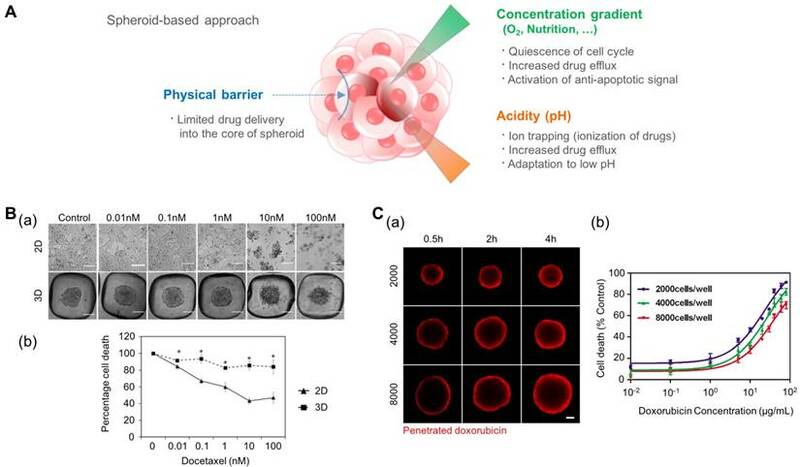 The tumor spheroid as a three-dimensional model for recapitulating the environmental cues originating from the high density of cancer cells such as a physical barrier against drug delivery, the concentration gradient of oxygen and nutrition, and low pH in the core of the tumor mass. (A) Representative features of tumor spheroids in terms of the physiological similarity with the native tumor. (B-a) The response of prostate cancer cell (LNCaP) spheroids in the aggregated form against the anticancer drug docetaxel. (B-b) The difference in cell viability depending on the culture dimension. Reprinted with permission from Chambers et al.. (C-a) The time-dependent penetration of doxorubicin into the tumor spheroids. Red: doxorubicin. (C-b) The size-dependent chemoresistance of human breast adenocarcinoma spheroids against doxorubicin. Reprinted with permission from Gong et al..
For these reasons, the spheroid model is promising in its ability to predict the cytotoxic effect of anti-cancer drugs. Chambers et al. developed a PDMS microwell system that produces cancer microaggregates (Fig. 3B), which form through forced aggregation. Using this system, LNCaP cells (human prostate cancer cell line) were cultured for two days with and without the PDMS well and were treated with docetaxel for 72 h. LNCaP microaggregates showed higher resistance to docetaxel compared to cells grown as monolayers. Imamura et al. developed patient-derived xenografts (PDX) as dense 2D plates or 3D aggregated forms and observed their chemoresistance and proliferation profiles. The cancer cells cultured in the aggregated form (3D) showed greater resistance to paclitaxel and doxorubicin and reduced expression of Ki-67 (a marker for proliferation) compared to the 2D cultured cells. From these results, the author concluded that the anti-apoptotic behavior of aggregated cancer cells is related to the dormant population of cancer cells. This reduced efficacy of chemotherapy in cancer spheroid models, compared to that of 2D models, was also observed in other cancer types such as leukemia and pancreatic cancer[120, 126]. In addition to differences between the monolayer (2D) and spheroidal (3D) culture environments, the size of the tumor spheroid is also an important issue. To address the size-dependent drug sensitivity of cancer cells, Gong et al. utilized agarose-based scaffolds, which have different sized microwells (Fig. 3C). They controlled the number of cancer cells in each microwell at 2,000, 4,000, and 8,000 cells per microwell, and controlled the size of the tumor spheroid in the range of 300-500 μm. They observed the penetration of doxorubicin by monitoring the fluorescence signals of cross-sectioned spheroids and found limited transport of doxorubicin into the spheroids with approximately 100 μm depth during a 4 h drug treatment. Therefore, the ratio of the drug-penetrated area was larger in the smaller tumor spheroids. When drug sensitivity is compared based on the size of the tumor spheroids, larger tumor spheroids demonstrate a higher drug resistance than smaller spheroids. Drug resistance observed in larger tumor spheroids is closely correlated with limited drug penetration into the large tumor spheroids. Because the anticancer drugs cannot be efficiently delivered into the core of the tumor mass, the development of drug carriers has been extensively studied. Tests of the drug delivery efficiency of carriers have shown that tumor spheroids are able to present a real-time monitoring window. For example, Albanese et al. demonstrated the size-dependent penetration of fluorescently labeled nanoparticles into tumor spheroids, showing more efficient delivery of smaller nanoparticles compared to larger nanoparticles into the tumor spheroids. Microfluidics refers to the technology that allows the manipulation of tiny amounts (10-9 to 10-18 liters) of fluids using channels with specific dimensions on the order of tens to hundreds of micrometers. Because of the physical properties associated with the microscale, microfluidic devices offer several advantages for the study of cancer biology. With the help of microfabrication techniques, a confined region with a small volume can be fabricated such as multiple microchambers, which are interconnected with one another via microfluidic channels. These isolated microchambers can act as individual cell culture modules[130, 131]. Furthermore, the laminar flow of the medium, in parallel with largely diffusion-mediated molecular transport, enables the establishment of a stable biochemical gradient[132, 133]. Therefore, various types and concentrations of biochemical factors can be tested in a high-throughput manner. For example, Kim et al. fabricated a microfluidic device with individually addressable multiple microchambers to generate tumor spheroids and to analyze the dose-dependent effect of anti-cancer drugs on a chip platform. MCF-7 human breast cancer cells were cultured in a 2D monolayer and 3D spheroid form and subsequently exposed to various concentrations of three anti-cancer drugs, mitomycin C, 5-fluorouracil, and doxorubicin. The cytotoxic effect was greater in the cells in the 2D monolayer form than in those in the 3D spheroid. This study shows that the microfluidic platform is useful not only for the mass production of cancer spheroids but also for high-throughput screening. The microfluidic platform can be used for the in situ monitoring of chemoresistant cancer cell behavior. Using a concentration gradient, the time-dependent emergence of chemoresistance can be observed. Han et al. fabricated an interconnected microchamber array, which was surrounded by two microfluidic channels. By passing doxorubicin-containing medium and normal medium in two anti-parallel microchannels, they established a stable concentration gradient of the anti-cancer drug across the array of microchambers. The U87 glioblastoma cells displayed sensitivity against the anti-cancer drugs, as reflected in the reduced number of cell-occupied chambers in the early stages of exposure to the drug. However, the cells acquired chemoresistance after day 5, as demonstrated by the reoccupation of microchambers, even in the presence of anti-cancer drugs. Thus, the acquisition of chemoresistance could be directly visualized by monitoring the microchambers. One of the advantages of the microfluidic system is the ability to reproduce the dynamic fluidic microenvironment that is critical for organ functionality and disease progression. Although the effects of hemodynamic fluidic shear stress on different cell types, such as endothelial cells and smooth muscle cells, have been extensively studied[137-139], the effect of fluidic forces on cancer cells is not yet clearly understood because of the diversity in tissue origin and drug-dependent sensitization mechanisms. Cancer cells experience two main types of fluid shear stress—one that results from the flow of blood in the vascular microenvironment and the other generated by interstitial flows in the TME[141, 142]. Interstitial flow is the slow stream of plasma passing through extracellular or intercellular spaces. Although the velocity of the interstitial fluid flow may vary depending on the location in the body, it is generally ~0.1 dyn/cm2 around tumors[144-146]. Interstitial flow plays a crucial role in the growth and pathophysiology of cancer. For example, the rapid increase in the volume of solid tumors induces outward flow, and this flow changes the drug delivery path, ultimately reducing the efficiency of drug delivery[148-152]. Furthermore, the flow reinforces the autocrine signaling in tumor cells, obtaining biochemical stimulation from the factors secreted by the cells themselves, and thereby stimulating directional invasion and migration[153, 154]. This interstitial flow-mediated directional cancer cell invasion is termed 'autologous chemotaxis'. Drug screening results using microfluidic platforms have demonstrated that the fluidic condition can change the chemosensitivity of cancer cells. Ip et al. demonstrated that shear stress enhances the chemoresistance of tumor spheroid cells (Fig. 4B). They cultured ovarian cancer cells in the spheroid form under a fluidic shear stress of 0.02 dyn/cm2 and treated the spheroids with cisplatin and paclitaxel. The cell viability under static conditions was low: 9.2% for cisplatin and 10.15% for paclitaxel. In contrast, under conditions of shear stress, tumor spheroids exhibited significantly higher chemoresistance with a 65.59% viability in the presence of cisplatin and a 69.9% viability in the presence of paclitaxel. From the changes in protein and miRNA levels and pharmacological inhibition studies, the authors proposed that the downregulation of miR-199a-3p and the consequent upregulation of phosphoinositide 3-kinase/Akt (PI3K/Akt) signaling as a potential mechanism for the fluidic condition-mediated chemoresistance. In contrast, Mitchell et al. reported that the chemo-resistant behavior can vary with the drug type even under the same fluidic conditions (Fig. 4C). When they treated colon and prostate cancer cells with tumor necrosis factor-related apoptosis-inducing ligand (TRAIL), the cancer cells demonstrated dose- and time-dependent increases in chemoresistance. However, when they treated those cancer cells with doxorubicin, there was no difference between the chemo-sensitivity of the cells under static conditions and that of the cells under fluidic conditions. In this study, the authors proposed the death receptor trimerization and subsequent recruitment of TRAIL-induced apoptosis signaling as the potential mechanism for TRAIL-mediated chemoresistance under fluidic conditions. In addition to the stimulation of membrane receptors in cancer cells, the fluidic shear stress can also affect the autocrine signaling of cancer cells. In recent years, the production of growth factors and the self-response to these factor, known as autocrine signaling, have attracted much attention because autocrine signaling stimulates cancer cells to proliferate and migrate and to prevent apoptosis[158-160]. Santoro et al. cultured Ewing sarcoma cells on an electrospun poly(ε-caprolactone) scaffold and applied fluidic shear stress using a flow perfusion bioreactor (Fig. 4D). Under the fluidic condition, the cancer cells showed enhanced secretion of insulin-like growth factor-1 (IGF-1) in the presence of fluidic shear stress, and the amount of secreted IGF-1 was further increased by adding exogenous IGF-1 in the fluidic culture condition. These results indicate that the fluidic shear stress can promote Ewing sarcoma cells to form a positive feed-forward loop of IGF-1 signaling. By adding IGF-1 ligand (dalotuzumab, MK-0646), the feed-forward loop could be broken. Such results imply that the chemoresistance of an anti-cancer drug is not simply a function of the fluidic condition but can be the result of a complex interaction between various factors such as receptor expression, fluidic condition, and drug type. Tumor angiogenesis, which drives de novo blood vessel formation towards the tumor, promotes the supply of oxygen and nutrition to the tumor. Since cancer cells can proliferate and even metastasize due to the existence of blood vessels, targeting tumor angiogenesis in conjunction with solid tumors has emerged as a methodology to treat cancer . In this regard, the vascularized tumor model, which is prepared as a hydrogel-laden microfluidic system, is a good platform to screen the cytotoxic effect of anticancer drugs to both cancer and blood vessels. For example, Sobrino et al. have developed a vascularized tumor model by coculturing the cancer, endothelial, and stromal cells within interconnected microchambers for 7 days. Since the endothelial cells spontaneously form perfusable vascular networks, which were connected to reservoirs, anti-cancer drugs could be delivered to the tumor through the vasculature. The authors introduced various anticancer drugs into the vascularized tumor-on-a-chip and screened their effect on the regression of the tumor or the blood vessels. This vascularized tumor-on-a-chip model can be extended to a 96-well compatible platform, and a library of anticancer drugs can be screened in a high throughput manner. In addition, a dynamic microenvironment can be incorporated in the vascularized tumor models. A cyclically stretchable lung-on-a-chip platform can give valuable information about the importance of the lung-specific mechanical environment in the chemoresistance of lung cancer. Hassell et al. have fabricated a multilayered nonsmall-cell lung cancer model by culturing cancer cells and lung epithelial cells on one side of the porous elastomeric membrane and endothelial cells on the other side. They found that the cyclic mechanical stretching not only suppresses cancer cell growth and invasion but also induces chemoresistance to tyrosine kinase inhibitor therapy. They found that the cyclic stretching-induced chemoresistance was attributed by the downregulation of epidermal growth factor receptor (EGFR) and changes in EGFR-related phosphorylation. This result implies that the tissue-specific microenvironment is an important factor for the identification of anticancer drug efficacy. Engineered platforms that mimic the fluidic shear stress around native tumor cells. (A) Schematic illustration of tumor spheroids and adhered cancer cells in a 3D matrix or circulating tumor cells upon exposure to a physiologically relevant stream. (B-a) A photograph and schematic illustration of the tumor spheroid-embedding microfluidic device. (B-b) The viable cells (denoted as Annexin V-/PI- cells) after the treatment with anticancer drugs in the presence or absence of fluidic shear stress. Reprinted with permission from Ip et al.. (C-a) The microscopic images of COLO 205 cells exposed to tumor necrosis factor apoptosis-inducing ligand (TRAIL) and fluidic shear stress. Scale bar = 30 μm. (C-b) Apoptosis of COLO 205 cells by TRAIL in the presence or absence of fluidic shear stress. The COLO 205 cells were treated with 0.1 μg/mL TRAIL before applying fluidic shear stress. *p<0.05. Reprinted with permission from Mitchell et al.. (D-a) Fluorescence images of the sectioned scaffolds with Ewing sarcoma cells. Blue: DAPI. Scale bar = 200 μm. (D-b) The released amount of IGF-1 in response to fluidic shear stress (S: static, B-04: 0.04 mL/min, B-08: 0.08 mL/min, and B-40: 0.4 mL/min). After the treatment with the IGF-1R inhibitor (MK-0646), the release of IGF-1 was reduced in all fluidic conditions, whereas the addition of exogenous IGF-1 significantly promoted the amount of released IGF-1. Reprinted with permission from Santoro et al.. The physical structure of the ECM in the TME plays a crucial role in regulating various cancer cell behaviors such as growth, proliferation, tumor invasion, transformation, and drug response in a number of cell types[48, 166-168]. The ECM can be described in a simplified way as fibrous physical structures and biochemical factors bound to the surface of fibers. Therefore, the structure and function of the ECM can be mimicked by fabricating an artificial matrix, which has similar physical structure, and subsequently coating it with biochemical factors observed in the native ECM[169-172]. In contrast to cells in two-dimensional culture systems, the cancer cells can form focal adhesions with a neighboring cell or ECM, but only on the surface of the artificial matrix. Therefore, the distribution and clustering of focal adhesions are different from those on a plastic dish, resulting in a change in the signaling pathway of focal adhesion kinase and its downstream cascade[174, 175]. Therefore, cancer cells, as well as other stromal cell types, show different cell behaviors including polarization, directional migration, proliferation, and modified intracellular organization on an artificial matrix[176, 177]. Since the anisotropic topography can mimic the remodeled ECM bundles and microtracks in the TME, this model was used to study the mechanism underlying the invasion of cancer in response to geometrical signals[178-180]. Such multiscale topography can be fabricated with various top-down and bottom-up methods. The top-down strategy refers to techniques that create small features on bulk materials such as laser machining and photolithography. The bottom-up strategy describes the technologies that build small units into organized forms, such as electrospinning and particle lithography. The details of these nanofabrication techniques can be found elsewhere[182-184]. In addition to inducing changes in the behavior of cancer cells, multiscale topography, as a biomimetic platform, can alter the cytotoxic profiles of anti-cancer drugs. Abdellatef et al. investigated the effect of surface topography on the cellular cytotoxicity and morphology of HepG2 cells. They cultured HepG2 liver cancer cells on patterned TiO2 substrates and treated them with cisplatin. Even with a short exposure (8 h) to the drug, HepG2 cells on the patterned substrate displayed a significantly higher cytotoxic response than those on the flat surface. Tan et al. investigated the effect of cell-morphology-like topography on the response of cancer cells to anticancer drugs (Fig. 5B). Human endometrial cancer cells were incubated on substrates containing cell-like features that had been fabricated using a bioimprint methodology. The mold was prepared as a positive (convex) and a negative (concave) surface. When the cancer cells were treated for 48 h with commonly used drugs, paclitaxel and doxorubicin, the cells showed the most reduced growth rate on the negative imprint pattern. It is assumed that the results might be regulated by the balance of forces generated by the substrate topography via adhesion complexes and the metabolism induced by the drugs. However, the mechanism underlying the increased sensitivity is not yet clear. Kim et al. prepared nanogrooved structures with UV-curable polyurethane acrylate (PUA). HeLa cells and human mesenchymal cells (hMSCs) were cultured on these substrates for 24 h and treated with cisplatin. The cytotoxic effects of cisplatin were observed to be dose-dependent in both cell types. There was no significant difference between the behavior of the HeLa cells on the flat substrates and those on the nanopatterned substrates. In contrast, hMSCs showed higher cytotoxicity when cultured on the nanopatterns rather than on the flat substrate. Considering that tissue regeneration is mediated by stem cells, this high death rate of hMSCs during the treatment process can be a potentially important issue. Therefore, the parallel analyses of the cytotoxic effect on stem cells and cancer cells is potentially beneficial in the drug screening process. Engineered 3D scaffolds can serve as a useful platform for anticancer drugs. From the structural point of view, the 3D scaffolds present penetrable pore networks in which cells can migrate and aggregate and thus present a more dynamic microenvironment for the cancer cells. For example, cancer cells form clusters on the scaffolds or invade into the porous networks in a prolonged culture. In addition, the amount of oxygen through the porous networks per unit time is limited, possessing potentials in the recapitulating in vivo-like concentration gradient. In collaboration with the limited molecular transport and the extensive consumption of oxygen by the cancer cells, the hypoxic and acidic microenvironment can spontaneously form, allowing a TME-like microenvironment. In the polymeric scaffolds, cancer cells also receive mechanotransductional inputs via integrin-mediated surface adhesion. Electrospun multiscale matrices can be used as a useful platform in the studies of three-dimensional cancer cell-matrix interactions. For example, Fong et al. cultured Ewing sarcoma tumor cells on electrospun poly(ε-caprolactone) scaffolds. These tumor cells spontaneously formed tumor cell clusters and showed enhanced resistance to doxorubicin compared to those cultured in a 2D monolayer (Fig. 5C). Furthermore, the Ewing sarcoma cells cultured on the electrospun nanofiber matrix showed enhanced expression of insulin-like growth factor 1 receptor, c-Kit, and Her2 compared to the conventional 2D cultured Ewing sarcoma cells. Such effect of cell-structure interaction can be evaluated by using 3D porous scaffolds. Ho et al. prepared the collagen-coated poly(lactic-co-glycolic acid) (PLGA) scaffolds to compare the effect of culture dimension (2D vs. 3D) (Fig. 5D) and prepared dissociated cancer cells and cancer spheroids to compare the effects of cell aggregation. They prepared four cases of in vitro cancer models depending on the aggregated form (single cell vs. spheroid) and the existence of scaffolds: (i) monolayer cancer cells (2D), (ii) tumor spheroids in 2D conditions, (iii) individual cancer cells embedded in 3D scaffolds, and (iv) tumor spheroids embedded in 3D scaffolds. 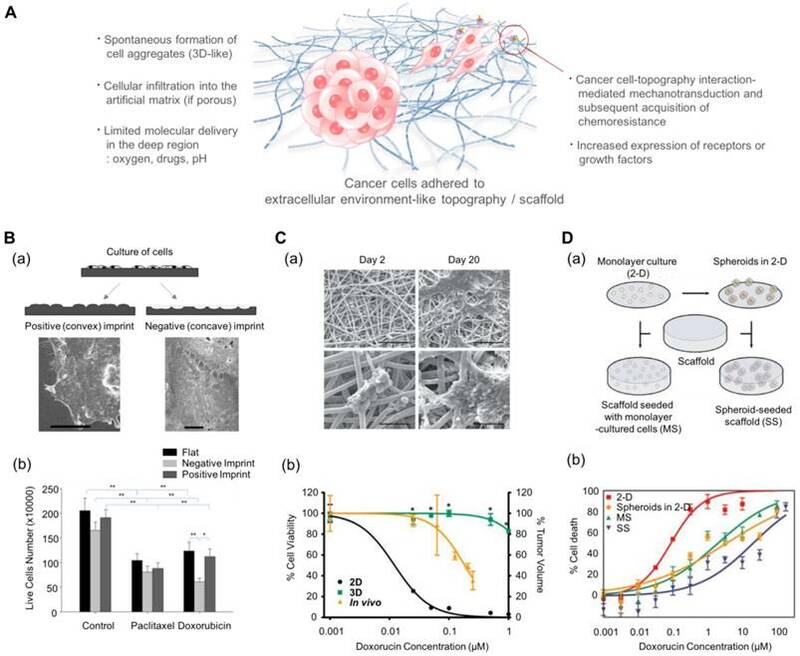 The 3D scaffold-embedded single cancer cells and spheroids showed higher drug resistance than those cultured on 2D scaffolds and even those in the 3D cultures, and the cancer spheroids demonstrated higher drug resistance than cancer cells seeded at the single cell level. The authors found that the enhanced drug resistance observed in the presence of scaffolds might be induced by the low pH-mediated glycolysis and higher production of angiogenic factors due to the acidic environment. Multiscale topography- and 3D scaffold-induced cancer cell behaviors that mimic the physical aspect of the cell-stroma interactions. (A) Schematic illustration of cancer cells (either spheroids or single cell) in response to multiscale topography and 3D scaffolds. (B-a) Preparation of the cell morphology-imprinted substrates. Two types of cell topography-replicated substrates (negative and positive) are prepared as well as a flat one for control. (B-b) The surface topography-dependent viability of the Ishikawa cells treated with paclitaxel and doxorubicin for 48 h. Cancer cells showed different sensitivities depending on the topography, showing the highest sensitivity in the negative topography. Reprinted with permission from Tan et al.. (C-a) Scanning electron microscope images of Ewing sarcoma cells cultured on a 3D electrospun poly(ε-caprolactone) fiber matrix. Scale bar: upper row = 200 μm and lower row = 50 μm. (C-b) The response of Ewing sarcoma cells to doxorubicin. Percentage of cell viability for the 2D and 3D culture conditions, and percentage of tumor volume for in vivo as xenografts. *p<0.05 for 3D vs. 2D. Reprinted with permission from Fong et al.. (D-a) The 3D scaffolds that can incorporate dissociated tumor cells and tumor spheroids. (D-b) Efficacy of doxorubicin against U251 cancer cells depending on the culture conditions. MS: 3D scaffolds with monolayer-cultured cells. SS: 3D scaffolds with spheroid-cultured cells. Reprinted with permission from Ho et al. Out of every few thousands of drug candidates screened and tested, very few drugs are approved for clinical use. Even if a drug candidate passes the preclinical studies, it is frequently dropped from the clinical trials because of unexpected side effects or toxicity. There might be multiple reasons for the low approval rate of drugs; however, scientists and bioengineers believe that this high failure rate is primarily caused by the use of less reliable testing platforms for screening the drug candidates. As shown by numerous studies, the effect of the anti-cancer drug can differ depending on the environment in which the cancer cells reside: 2D vs. 3D, static vs. fluidic, noncoated vs. matrix-rich, and smooth vs. textured. In recent years, mouse models have been predominantly used in anticancer drug discovery due to their close resemblance to human tumors. The xenograft mouse model is the most commonly used preclinical model for evaluating the efficacy of anticancer drugs. Xenograft models are established by implanting human cancer cells into heterogeneous mouse tissues (such as human brain cancer cells to subcutaneous tissue, which is termed heterotopic) or into the same tissue origin (such as the implantation of human brain cancer cells to the mouse brain, which is termed orthotopic). Although this in vivo xenograft model has revolutionized the drug discovery process, it does not reflect the human tumor microenvironment such as the immune response because of the utilization of immunocompromised mice. A more advanced model, patient-derived tumor xenograft (PDX), has been developed. The PDX model utilizes patient-derived primary cancer cells when establishing in vivo models; therefore, this model better reflects patient-specific drug responses, showing the possibility to be used in personalized medicine. However, the PDX model also has several unresolved limitations such as a time-consuming process and high cost. To overcome the limitations of in vivo mouse models, researchers in biomedical engineering have been working on the development of more in vivo-like models. By developing more physiologically relevant models and using them in the drug discovery process, drug screening speed and efficiency will increase, and developmental costs will decrease. There are additional issues in the development of physiologically relevant in vitro platforms. First, high-throughput screening ability is required for testing large numbers of drug candidates. In the initial stages of drug screening, different concentrations of thousands of drug candidates are tested on various cancer cell types with different genetic mutations. Thus, the number of combinations is so large that high-throughput screening becomes a critical need. To address this issue, pharmaceutical companies have been employing well plate-based assays using 96- or 384-well plates; however, these platforms only provide a two-dimensional, static environment. Recently developed technologies such as patterned spheroid arrays are believed to resolve this high-throughput screening issue without sacrificing the physiological features of the tumor microenvironment. The second issue is the development of precision medicine or patient-specific drugs. Recent strategies of pharmaceutical companies include targeting specific genetic mutations, signaling pathways, cytokines, and enzymes with target-specific antibodies. Since the therapeutic effect of a single drug or drug cocktail depends on the individual patient characteristics, the identification of an effective agent in an in vitro model prepared using patient-derived cells is a promising approach for the development of targeted treatments. The organ-on-a-chip, an organoid made of patient-derived iPS, and PDX models can be useful for this strategy. However, in some models, the time required to establish a platform is so long that a more innovative approach with reduced process time is critical for the effective treatment of patients. Third, the acquisition of patient-derived cells and the establishment of reliable cell lines are also important issues in the development of physiologically relevant in vitro models. To address the advancement of antibody-based chemotherapy, cancer cells expressing specific ligands and activated signaling pathways are needed to test the efficacy of newly developed drugs. However, the limited availability of patient-derived cells for use in precision medicine and the stable cell lines for high-throughput screening hinders the development of in vitro models. In addition to that of cancer cells, the availability of patient-derived stromal cells is also essential because of their largely unknown regulatory mechanisms. Finally, including multiple environmental factors in a single platform is also an unmet need. Although the effects of individual factors, such as ECM, flow, pH, and hypoxia, have been investigated, their synergistic role remains largely unknown. In stem cell research, stem cell differentiation is synergistically enhanced when multiple cues are provided simultaneously[199, 200]. These results imply that the tumor cells might also be synergistically affected by the environmental factors because of their inherent complexity. Therefore, such synergistic effect of multiple environmental factors on cancer progression and chemoresistance needs to be investigated. In particular, the interaction between cancer and stromal cells is largely unknown because of the limited number of available cell sources and analysis techniques. It is expected that more reliable in vitro cancer models will be developed in the future because of the advancement of engineering techniques and the abundance of cell sources. These advanced platforms can revolutionize the drug discovery process. In this article, we have summarized the recent advances in the development of drug screening models, specifically those used to study the efficacy of anti-cancer drug candidates. We first gave an overview of the characteristics of the tumor microenvironment in terms of physical and biochemical properties including hypoxia, pH, interstitial flow, cell-cell and cell-matrix interactions. Next, we discussed engineered platforms that attempted to reproduce these environmental factors. Finally, the changes in the cytotoxicity of anti-cancer drugs in response to the engineered environmental factors were summarized. Several studies comparing the cytotoxicity of different anti-cancer drugs have shown that drug efficacy is strongly influenced by the culture conditions of the cancer cells. However, the current technologies do not fully mimic the complex microenvironment of the tumor because of the limited availability of fabrication techniques, biomaterials, and cell sources. If the in vitro cancer models can mimic the in vivo physiology more closely, the efficacy and toxicity of drug candidates can be gauged accurately. This work was supported by the Nano•Material Technology Development Program through the National Research Foundation of Korea (NRF) funded by the Ministry of Science and ICT (No. 2017M3A7B8061942) and by the National Research Foundation of Korea (NRF) grant funded by the Korea Government (MSIT) (No. 2018R1A2A3075013). This research was also supported by the KIST Institutional Program (2E27910).